Georgia and I were back in Wisconsin Dells over the last weekend. It is one of our favorite getaway destinations since it is less than three hours away and we always enjoy our stay. But, because we do go there often, we are always looking for activities that we haven’t done before. This trip we decided on the Lost Canyon by horse drawn wagon tour. 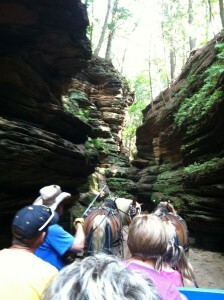 Lost Canyon is the longest and deepest all land canyon in Wisconsin. This tour goes about a mile in before turning around. While it might be long and deep, the canyon is not very wide. In some places the blue paint scrapes on the rocks prove that the walls are barely far enough apart for the wagons to fit. The drivers have to coax the teams through with voice commands. The sun never penetrates into many parts of the canyon so it is cool even on hot summer days. We enjoyed this tour and would recommend it to anyone vising the Dells. Of course, we also spent some time at Ho-Chunk Casino. In fact, our usual hotel didn’t have any vacancies for this weekend so we stayed in the casino hotel. All in all, it was a relaxing and enjoyable weekend getaway.